The West Liberty Historical Society Town Hall Committee’s goal is the restoration and renovation of the Town Hall and its 2nd floor Opera House, a valuable center of activity for the community and surrounding areas. The Opera House hosted many community events from its opening in 1869 to the late 1950’s. Once restored and renovated, the Opera House will once again be a focal point for the West Liberty community. It will provide a unique historic setting for a wide variety of events. 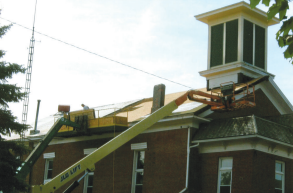 Phase 1 included a new roof paid for by the Village of West Liberty. ($47,000.00) Donations were solicited and received from present and past citizens of the community for needed tuck pointing, new historically correct windows and restoration of the bell tower for a total of $69,606.08 The labor to install the windows was donated by a local craftsman. Phase 2 involved finding a new location for a fire truck. This was accomplished by purchasing a nearby building ($60,000.00). 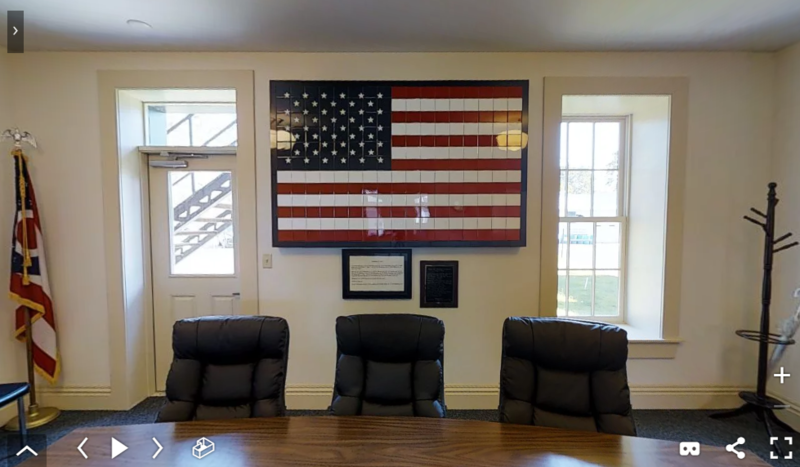 The remainder of this phase was the remodeling of the first floor to accommodate the office of the Village Clerk, Liberty Township meeting space, West Liberty Village Council meeting space, new public restrooms and landscaping. All areas are ADA accessible. The total for this work is $190,520.67 paid for by contributions from current and past community members, small businesses and two small grants. Also included in Phase II is a new HVAC system paid for by the Liberty Township Trustees ($30,000.00) and exterior brick work paid for by the Village of West Liberty ($18,000.00). Phase 3 is the final step in the Town Hall Restoration project. The 2nd floor Opera House will be restored to its original appearance while being suited to today’s needs. We have removed insulation in the original stairway area and the plaster has been evaluated to determine no asbestos exists. A new front entrance will be in place, the old stairs leading to the second floor will be replicated and an elevator will be added so that all may have access. There will be good lighting and sound systems, the fresco painting and stencils restored, and at least some of the original seats installed. The Opera House Community Center will be a facility capable of accommodating groups of up to 150 people. miles around! I continued to be popular for events and gatherings, the seats were filled! The years brought me a new sloped floor, and theater seats. In about 1940, at only 72 years of age, activities within my doors began to slow down. Sadly, eventually I was condemned! I might as well have been dead! The voices, the music, the laughter, all were gone! tune, and I wasn’t asking for much. I just wanted to be a center of activity for our community enjoying music, voices, laughter and footsteps coming and going again! I’m older (wiser?) than the theaters north and south of me, and won’t be used in the same ways, but I love our town and its neighbors and want to be available for them all to use. Another happy day! Work began on my first floor! It is rejuvenating as I hear the voices up through the floor! They say it’s beautiful and people love seeing it and the old pictures of how my building originally looked. New public restrooms, township and village meeting spaces, a village office; Great! But... I’m still up here all alone! Can you help make it happen? I won’t disappoint! You and I will be so grateful!